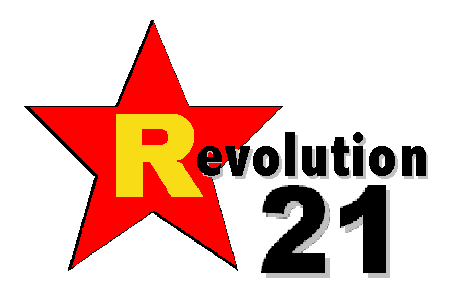 Revolution 21's Blog for the People: Lovely. Just lovely. Every time the experts take a closer look at the Gulf oil spill, it gets five times bigger. The Gulf of Mexico oil spill could be leaking at 25,000 barrels a day, five times the government's current estimates, industry experts say. Basing their calculations on government data and standard industry measurement tools, the experts say the Gulf spill may already rival the historic 1969 Santa Barbara, Calif., and 1989 Exxon Valdez disasters. The massive spill began washing ashore Friday along the Louisiana coast, reaching the mouth of the Mississippi River delta. The disaster also threatens to blunt new oil drilling along coasts, a politically sensitive issue as Congress debates climate change legislation. 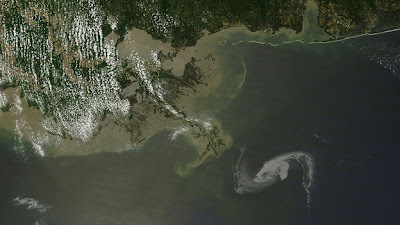 The slick started oozing near Louisiana's fragile islands and barrier marshes overnight. Boats patrolled coastal marshes Friday looking for areas where the oil has flowed in, the Coast Guard said, and the state diverted thousands of gallons of fresh water from the Mississippi River to try to flush out the wetlands. Reiterating the U.S.'s efforts to respond to the spill, President Barack Obama said Friday that the federal government is "fully prepared" and doing "everything necessary." The president said he has ordered Interior Secretary Ken Salazar to report to him in 30 days on "what if any additional precautions and technologies should be required to prevent accidents like this from happening again."